The evolutionary expansion of Kenneth Faried’s offensive game has been covered in this space, and that was before the Denver Nuggets’ third-year power forward went on his current run in which he’s averaging 20 points and 10 rebounds in his last 18 games. 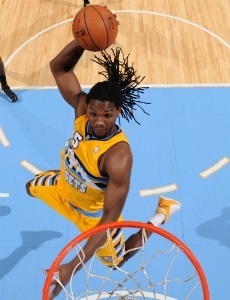 Earlier this week, Faried posted 34 points and 13 boards in a win over the New Orleans Pelicans. By putting up those numbers in just 27 minutes of action, Faried joined Charles Barkley, Alonzo Mourning and Scottie Pippen — all three of them members of the Basketball Hall of Fame after Mourning was voted in on Thursday — as the only NBA players to go for at least 34 and 13 in less than 29 minutes. After the game, Nuggets point guard Ty Lawson compared Faried to one of those Hall of Famers. Faried, a practicing Muslim from New Jersey, had raised his season averaged to over 13 points and eight rebounds after struggling for most of the first half of the season while his name was constantly surfacing in trade rumors. After the February 20 trade deadline passed and Faried was still in Denver, he seemed to blossom almost immediately.